← Have a Hard Time Saying "No"? Crisis doesn’t have to kill strategy…as long as it doesn’t kill strategic thinking. I am in the early stages of working with a successful, locally-owned pawn broker and jewelry business that, in almost 20 years of doing business, has a sterling reputation (pardon the pun). This begins and ends with the 50-year-old founder and owner, whose business practices are built upon his deep care for his employees and customers. Among other things, he sees his business as a path to prosperity for all of them, and they are loyal in return; thus, the sterling reputation. He is setting sales records in his main store; a second store is coming into its own; and now there is talk of a third location. Customers love the business and keep coming back. Employees love their work and the quarterly bonuses they receive. The owners love knowing their creation works, and works well. But growth and success has its costs. The owner, or especially the owner’s wife, wants him to be able to relax in a few more years, not spend as much time on the day-to-day aspects of running the business, and retire in 15 years. This sets up a series of decisions, challenges to overcome, opportunities to act upon, people to develop, and organization to build and improve upon. This requires strategy. Is the owner too busy working IN his business to work ON his strategy? That question, and its short- and long-term impact, is what I must help him recognize first. Is the owner too busy working IN his business to work ON his strategy? Author Chris McGoff presents an eloquent model for strategic change he calls the Core Prime. Below is a graphic illustration of the Core Prime and I recommend his book and website for his straightforward graphic illustration of core business matters. Now back to my pawn and jewelry business owner. 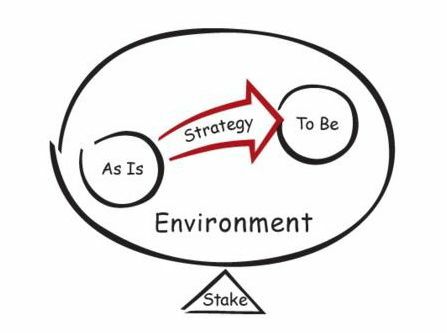 He recognizes his great need for strategy that his managers and employees will understand clearly and act upon daily. He does not recognize how he is so wrapped up in working in his business, focusing on the “As Is” and the challenges of his current environment that he loses sight of what he seeks to create and the strategy necessary to work on his continuing creation. What is at stake for him, his employees and customers gets lost in the fog of daily and weekly busy-ness. As a result, he is barely able to step back and consider what his business is “To Be”, how the environment will change and what is at stake if he succeeds or does not. He wants to turn over daily operations to capable managers so he can focus on bigger goals, including growth, expansion and yes, even his own leisure life. He wants a strategy and business plan in place that gives his managers, employees and customers a clear line of sight of what is most important to keeping the business successful. He wants to increase his customer base and Customer Loyalty through the best customer service and processes available. He wants to eliminate the stained image of the pawn industry and to do so he must drive competitors who perpetuate that image out of business. He wants industry recognition as being the “best” in his market class. He wants to increase his loan base by another 25 percent. Are you viewing your longterm desires through the fog of current challenges? Or are you viewing current challenges through the clarity of strategy and your desired aims? How might you be letting your crisis of the moment interfere with your intentions for sustainable success? How might a change in perspective help you? How might shifting your attention from the “muck and mire” of today to the “To Be” of your desired tomorrow change how you address daily challenges? Don’t let today’s crisis prevent you from thinking and acting strategically. Your business depends on it. This entry was posted in change, Chris McGoff, core prime, crisis leadership, growth, jewelry, pawn business, strategic planning, strategy. Bookmark the permalink.